Camphor is transparent solid flammable compound with odorant fragrance. Basically it is obtained from the tree i.e. Camphor laurel tree which is also known as the kapur tree a large evergreen tree found in Asia. Moreover, camphor can be produced synthetically from the turpentine oil derived from the rosin. Sublimation properties give its several uses. It is used plasticizer in nitrocellulose and raw material for fireworks. Camphor is mainly used in pharmaceutical sector to produce medicines for the skin infection, cough and others. It is also widely for holy purpose in India. Further high level of camphor can be toxic and hence causes several health hazards. Global camphor market is anticipated to grow at a CAGR of 7.9% over the forecast period. Factor such as the growing demand of the camphor in making medicine for different type of diseases is expected to drive the growth of the camphor market in upcoming years. Due to good chemical properties it has wide range of application in various end user industries such as pharmaceuticals, food, agriculture and chemical among several others. It is also used for making ointments with vapor for treating cough and chest congestion. Rising demand of camphor for the ointments is anticipated to drive the growth fo0 the market. North America is prominent market of camphor is expected to witness of high growth rate over the forecast period. Increasing population leading to to high growth of food and pharmaceutical is major factor which drive the growth of the camphor market. The market is mainly expanding on the back of the growth and expansion of pharmaceutical industries in the region..
Further Europe is expected to grow at a significant CAGR over the forecast period. 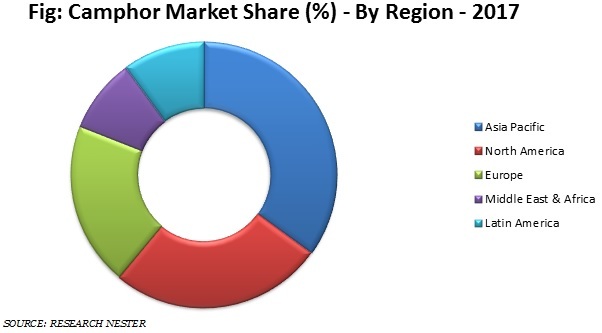 Rising Advancement and research activity to increases application for camphor is expected to offer large number of opportunities in the camphor market. Camphor has wide range of application in pharmaceutical. It is used for medicinal purposes for the treatment of toenail, warts, cold sores, hemorrhoids, osteoarthritis, congestion, cough, and skin infections. Generally in pharmaceutical it is used in the form of oil. It also can be used as antiseptic germicides and others. Further, proper dosage of camphor cure the health and high can be cause of serious problem due some toxic nature. These factors are opening a gateway of opportunities for the growth of the camphor market. Apart from this, camphor finds their use in several end user industries such as agriculture, food, chemical, pharmaceutical and others. The growing demand of camphor in pharmaceutical industries is expected to positively impact the growth of camphor market during the forecast period. As population is increasing worldwide the demand of the food product is also increases which predicted to trigger the growth of camphor market during the forecast period. In contrast, high flammability nature of the camphor is anticipated to negatively impact the growth of the dimethyl camphor market during the forecast period. The Ji'An Cedar Fine Chemical Co., Ltd.